In the age of the French Revolution, opera was the locus of cabals, intrigues, and violent journalistic invective. Yet it was also a period when women composers and librettists gained access to concert halls as never before, some of their works among those most performed in Paris. Jacqueline Letzter and Robert Adelson's engaging history explains what made this possible. At the same time it demonstrates how the Revolution fostered many dreams and ambitions for women that would be doomed to disappointment in the repressive post-Revolutionary era. The first part of the book concentrates on the women who succeeded in bringing their operas to the stage. The authors examine their backgrounds, the institutional barriers they had to surmount, and the problems they faced in asserting their authority and authorship. 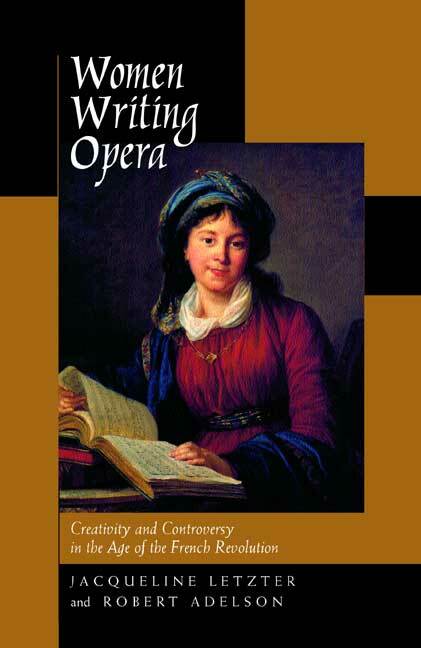 The book's second half is a detailed case study of Isabelle de Charrière (1740–1805), a prolific author and composer who witnessed the success of her female colleagues but was unable to gain recognition for herself. In an analytical epilogue Letzter and Adelson discuss the status of creative women in Revolutionary culture and society. Jacqueline Letzter is Assistant Professor of French at the University of Maryland, College Park. Robert Adelson is Assistant Professor of Clarinet at Towson University.